The wind blasted across the eastern corner of Kent last night with the narrow line of the cold front passing between 5 and 6am. I clambered out of bed and drove the 500m down to the Bay. 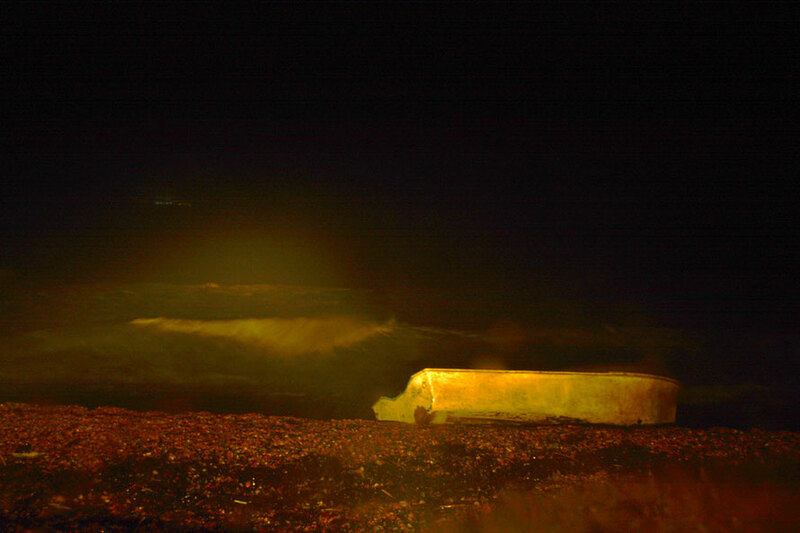 At what passes for a slipway - a shingle bank - I turned the car's lights onto the beach and sea. A boat was washed up on the shore, the waves were crashing and the driven rain drove. The Shipping forecast had given sea area Dover Severe Gale Force 9 to Violent Storm Force 11. It was a strange ghostly scene with the lights of one of Dover's ferries stuck outside the port (it closes at Storm Force 10) just visible, holding its position in the mouth of Trinity Bay in the more sheltered water formed by the notorious Goodwin Sands. I turned off the engine, rested the camera on the steering wheel, turned the exposure compensation down as low as it would go and hoped for the best. To be honest, I was expecting a rather more dramatic scene with waves bursting on the sea wall but it was a neep high tide. Down in the bay at 5.45 AM, the lights of a ferry waiting in Trinity Bay just visible on the middle left. Still I'm glad I went. The inky darkness of the stormy sea and the solitude of the normally busy bay was eerie. I drove back up Bay Hill avoiding the light debris blown out of the trees and made myself a decent breakfast. For a tale of what it was like on one of the much smaller ferries back in the 1987 Great Storm see here on my website. I went down later to see whose boat it was. Couldn't see anything. Then I noticed a skiff called 'Accassia' that I'd seen some lads using for a video project. They'd painted one side of the hull white and one side black. Luckily for me in the inky dark this early morning the sea had turned the white side to the beach. Old Fred, the only guy who still goes out regularly from the bay, had moved his boat up into the parking area after he'd got caught out by the storm surge last winter. A body came up on the beach not long ago. Stark naked. Just near the boat in the picture. It was a young Polish man who'd stepped off the cliff in despair. I met a bloke later who said he'd found a pair of trousers. A nice pair of jeans. Further up the bay in the tangle of a huge rockfall. With coloured stitching. Nice they were. He intended to wear them, he said. For mucking about. 'But those might be dead man's trousers,' I said. 'Well', he said, 'they'll not do him much good now, poor sod'. But I doubt he wore them.